Missy Franklin On Winning Gold: 'Someone Needs To Pinch Me' : The Torch Swimmer Missy Franklin, 17, is being hailed as the next great U.S. swimming star, after winner her first gold medal in the London Olympics. She says that while standing on the podium, she thought about "all the things leading up to that moment. And it was so incredibly worth it." 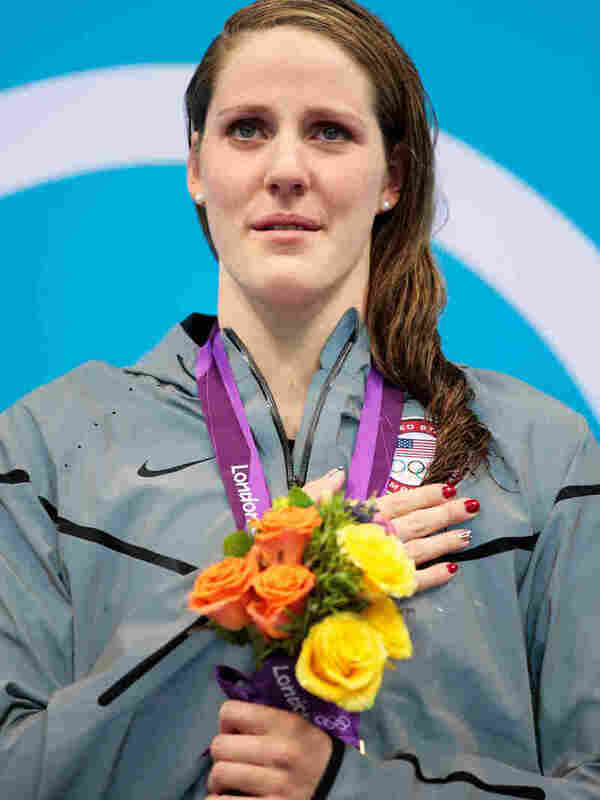 Missy Franklin stands on the podium with her gold medal, after winning the 100m backstroke at the London 2012 Olympic Games. Of that moment, she says, "I was trying to sing, but I was like, crying, at the same time." The 17-year-old high school senior from Aurora, Colo, has that long and lean build perfect for swimming. Long legs; long arms; a long and muscular torso. And big feet: Her parents bought her boys' shoes when she was a kid, because the girls' sizes were way too small. In the pool in London, with Seebohm closing in on the gold medal, Franklin dug deep, as backstrokers do: arms stretched back in rotation, hands flat like paddles, and those legs and feet kicking hard. Stroke, stroke, stroke, a sudden lunge to the wall, and it was over. Franklin then did what every competitive swimmer does after touching the wall. She turned to look at the scoreboard for her place and time. "I just saw that board and saw that number one, and after thinking about it and imagining it... happening for so long, it doesn't seem real," Missy said later. "You've dreamed about it so often that you still feel like you're dreaming. I still feel like someone needs to pinch me." Later on the deck, as she stood on the highest step of the medals podium, she wiped away tears, with a hunk of gold hanging from her neck. Franklin tried to sing, as "The Star Spangled Banner" played and the American flag rose above the pool — "and then I forgot the words, because I didn't know what I was doing," she recalled, smiling and laughing and bouncing with every word. "Just seeing that flag being raised — all the things that I've gone through passed through my mind. The early morning wakeups. The practices... All the meets. Just all the things leading up to that moment. And it was so incredibly worth it." "What about endorsements?" a reporter asked her, knowing that Missy has tapped neither fame nor fortune so far. She and her parents have insisted that she stay in high school like a normal kid, and not use tutors while training and traveling to meets. "Are you still going to go down this road of turning down the millions of dollars that may come your way?" the reporter continued. Ever the backstroker, Franklin reached back toward normalcy. She's just out of braces, after all. "I do want to swim in college more than anything," she said. "But I'm not thinking about that right now. It's only day three [of the Olympics]. We still have five more to go.... But swimming collegiately is something that I've always wanted to do, and have a passion for." Missy — and we're all just calling her Missy now — is so gee-whiz about her golden moment, she makes giddiness seem like a performance-enhancing drug. But, as a veteran of reporters' sit-downs with newly-minted gold medalists, I noticed something missing from Missy's moment. There she was, in bright television lights with Olympic logos behind her, with hair that was still wet and stringy from the race of a lifetime. And her neck was bare. "Where's your medal?" I asked. The smile got bigger as she considered such a seemingly silly question. Clearly she hadn't actually planned for her first gold medal appearance before Olympic reporters. "In my pocket," she said, beaming. "Can we see it?" I asked. "Yes," she giggled, "It's right here." And then Missy did what many suspect she'll be able to do many more times in her swimming career. She pulled the medal out of her sweats, and cradled it in her hand. "Isn't it pretty?" she squeaked, breaking into a sustained laugh. Missy will swim for more of these moments, beginning tonight with the 200 freestyle. She has a herculean schedule ahead, with the 100m freestyle heats and finals tomorrow and Thursday, the 200m freestyle Friday, and a relay Friday and Saturday. And she'll have a great time doing it.